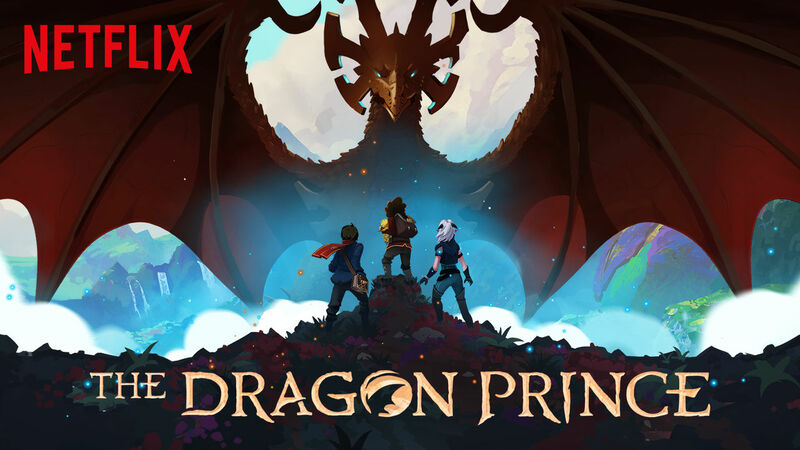 Netflix has just dropped season 1 of The Dragon Prince, a fantasy CGI animation from Aaron Ehasz, the head writer and director of the critically acclaimed Avatar: The last Airbender. Of course, I had to binge watch it so that I could complain about it. I will admit that going in I was biased because I hate those middle earth type World of Warcraft fantasies. I think most lack originality and depth. And after 3 hours I can safely say… I was right! Set in a world where humans and elves are at war, The Dragon Prince follows two human princes and an elf assassin as they journey to return a stolen dragon egg to restore peace. As far as a 2018 family animation goes, it is stylistically unique. On a landscape of bubbly bean-faced comedy characters that cater to 6 year old boys with a sugary cereal addiction, I can safely watch without having my mind numbed. The 3D animation that appears like a 2D illusion looks very impressive. The choreography puts you on edge. It’s like watching a video game cut scene but you don’t want to skip. My main problem is when they put down the weapons and start talking. Everything is shallow and not to be taken seriously. The stakes are high but its tone doesn’t feel like it. Every character has to interject a stupid self-aware joke and it is all the same comedy type. The skit goes like ‘I made a quirky joke’, ’yeah you made a quirky joke’ then they proceed to beat the dead horse whilst milking a cow. The fourth wall breaks take you out of the fantasy. Instead of exploring a trope they proceed to do a weird mixture of subverting and being self-aware that they are the embodying the said trope. For example, the main villain has his two children act as his comic relief henchmen. One is Claudia a witch, and the other is Soren a knight. Whilst I’m glad they made Claudia bubbly instead of being a seductress and bitter witch, Soren is a flat jock idiot, which is very disappointing. Their antics become tedious and overused to make drama seem less depressing but really it trivialised the tension. Like the coffee joke at the funeral. It sounds funnier then what it is. Avatar: The Last Airbender was the master of mixing comedy with sombre moments. Part of it comes from its diverse set of characters allowing the writers to be flexible with comedy types. Another part of it was respect for the story and its dark themes. Avatar, like Dragon Prince, is about war and its effects. In the episode ‘The southern air temple’, the young avatar, Aang, who has just awakened from a 100 year coma, travels with his friends to reunite with his Airbending tribe. Throughout the episode his friends try to break it to Aang that the Airbenders were killed in a genocide. Throughout the episode the playful Aang is in denial until he sees the skeleton of his old master. Then the laughter stops and he goes into God mode. It is heavy stuff for a kids show made in 2005, but it is perfect. The characters, themes and culture of The Last Airbender are intertwined with each other. It is an Asian inspired fantasy. Aang is from the air tribe, who emulate the peaceful life style of Buddhist Tibetan monks. Part of Aangs character arc is that he is non-violent and in conflict with dealing with war despite being the chosen one. The story goes in depth with themes of spirituality and materialism. It is authentically Asian without it being culturally inappropriate or generic and it’s religious in a way that it sparks intrigue. Dragon Prince on the other hand lacks culture. All of the human tribes have collaborated with each other. Whilst it is nice to see that the kingdom is diverse, with a black king and mixed race prince, the diversity is skin deep – literally. There is nothing that indicates any African or Mediterranean culture. Its ambiguous European. And its not even fun ambiguous European – like in Disenchant mentor Brüno– who through research, the writers have taken inspiration from medieval Britain and the European fashion scene. It also lacks in religion which is integral to medieval European culture. Avatar did so much with introducing Buddhism, Hinduism and Shintoism to a western audience. I know you’re probably sick of Christianity but what you learn from those boring RE lessons only scratches the surface of how integral Christianity was to western civilisation. Exploring how the monarchy, patriarchy, and religion interacted could be thematic and interesting. At first, I though this series was going to explore genders roles and holy orders when the witch Claudia mentioned she wished she could learn sword fighting, but nope. You get both male and female warriors and mages, and no one mentions gender. You could explore the idea of suffering because Christians love to suffer. The crusades, sainthood and martyrdom. The persecutions. The many persecutions in European history. Christian on Christian violence is a real thing you know and it’s all shrouded in corruption. The Lion the Witch and the Wardrobe is jam packed with Jesus imagery. Aslan didn’t die for our sins for nothing you know. These days you cant touch Christianity with a barge pole in kiddie media. It is X mas not Christmas. Is it because of secularism? Or is it because they don’t want to upset the bible belt parents if a kid show doesn’t portray Jesus in a certain light? It is interesting that many kids show’s will make fun of Buddhism and Hinduism or ‘use it as inspiration’ (be culturally inappropriate as they make kung fu references). The big Abrahamic three can be very touchy feely with its portrayals in general (that Christianity, Judaism and Islam). Perhaps its because they are absolutists. In Abrahamic religions the word of God is final… with a small leeway for interpretation. In Eastern religions the answers are within you. It is more subjective. Maybe that’s why Buddhists won’t kick off as much when they are portrayed in a certain way because there are many interpretations. That would be a great theme for Dragon Prince to explore -absolutism. It would be fitting in a world of polarisation. Whilst the show makes some attempts to portray both the humans and elves as being unreasonable it doesn’t go deep enough because there is barely any culture to be polarised about. Overall, I don’t think I will be encouraging my friends to watch the show! In Dragon Prince Season 2, a scene presents the parent’s of a child-queen: “…your parents, the queens of Durin” with two noble women standing there: indoctrination of our children into LGBT ideology. Parents should force the government to establish another content warning: when LGBT content such as transgender and gender fluidity is present in a children’s show to protect our children from confusion until their brain is ready and they have the maturity to explore plurality of opinions without necessarily accepting them as their own personal truth, especially on the subject of sexuality and various gender identities and lesbian relationships in this case. Sliding it secretly into a second season felt despicable to me. Propagandists! Imagine if the gospel of Jesus were introduced in such a fashion resulting in children ask their parents about God and wanting to know Jesus. There would be an uproar. The whole population cannot be forced to think or to behave as if it adheres to a particular religion. Therefore, the population cannot be forced to adhere to any systems of thought, especially the relatively new pseudo-scientific ideology of transgenderism. I’d much rather extreme leftist experiment within their own groups and associations and show society the example for another 50 years or so. They should push their ideology on their own children, not the children of others and let’s see what happens. How it is done biologically? How can queen Aanya of Duren be born from 2 woman? Is it a thing in this world? Or there was marriage with some man which is in fact a father of Aanya? Then which queen was mother of Aanya? ← Changing the Face of Fashion – Diversity on the Runway.